Down & Dirty: Look what my friend gave me! We don't put up a Christmas tree. Not that we have anything against Christmas trees, but we don't have kids and we're never here for the actual day so it seems like a lot of trouble for nothing. Imagine my delight when O.E. 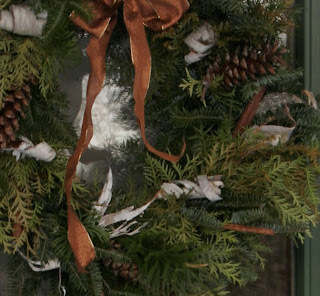 (aka Other Ellen, aka Wreath Goddess, aka Ellen Spector Platt, aka my partner @ Garden Bytes) asked me if I'd like a wreath. Yes, I said, yes, yes, yes! She brought it to my apartment, I brought it to my house, and look how pretty! I feel suddenly very festive and oh so in the holiday mood. It looks as though it smells good, too. Beautiful! For the past four years I've recycled a wreath I bought at the coop. Last year it was finally crumbling and I parted with it. Was all set to buy one this year but A) I won't be here for xmas and B) on the same day I found that oyster mushroom in Prospect I found some long, gorgeous, fragrant pine cones. Rigged something for my apt. 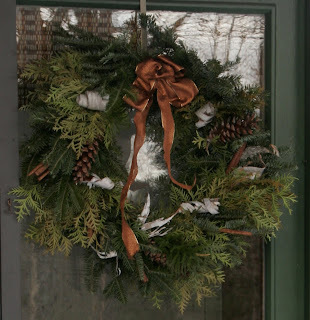 door and I'm happy with it...but nothing as fine as your wreath!